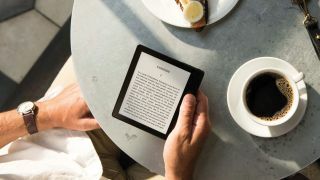 The Amazon Kindle Oasis is the fourth ereader to join the current Kindle line up, and it's the retail giant's most expensive, and lightest reading device ever. Just how expensive? Well the world's longest overdue book – which was 47 years overdue from a library in Illinois, USA - cost the borrower US$345.14 (about £203, AU$451), which is still less than the $289.99 (about £269.99, AU$449) Amazon Kindle Oasis. The Kindle Oasis has a brand new form factor compared to previous Kindles. It's exceptionally thin on one side - just 3.4mm thick - while over on the opposite side is noticeably chunkier in an attempt to make it even easier to hold one handed. It weighs 131g making it the lightest ever Kindle, a record previously held by the 180g Voyage. The screen from the Kindle Paperwhite is here as well offering 300ppi, but the real highlight is the 60% brighter display thanks to a redesigned front-light. The battery life of the Kindle Oasis is less than other Kindle devices thanks to the slimmer design, with Amazon claiming you'll get two weeks of usage from a single charge. However, every Kindle Oasis also comes with smart power case in the box which has an additional battery built in to boost your usage. It easily clips onto the ereader, giving you a stylish case as well as keeping you going for an average of seven weeks between charges. The Oasis comes with the latest Kindle software meaning you get the redesigned interface the company rolled out earlier in the year. The problem with the Kindle Oasis may well be the price. It sits at the top of the Amazon Kindle range and you'll still be able to buy the cheaper Kindle, Kindle Paperwhite and Kindle Voyage.